time is indeed flying, as I can see my last post is from February! Amazing how fast time goes when you are busy :-). 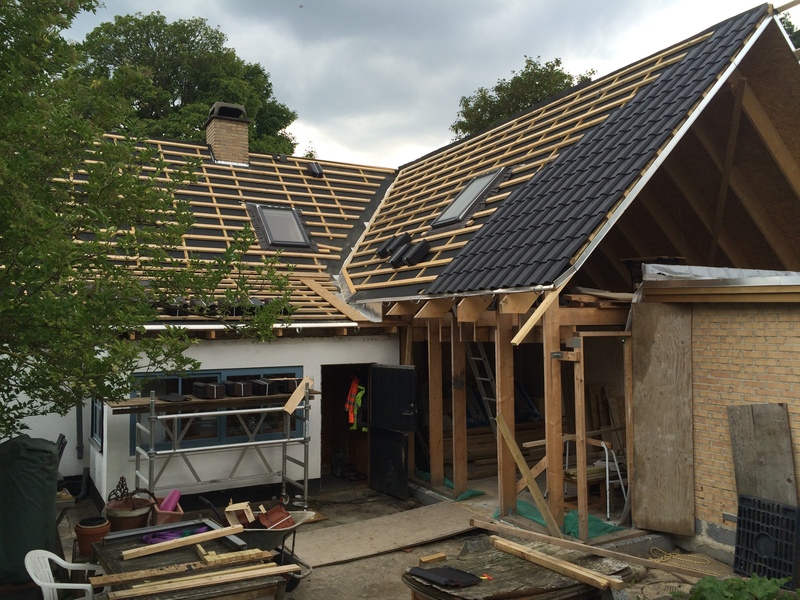 And busy we are, as my husband and me are renovating our house to have more space and…place for a brewery! Yes baby, a ‘professional’ home brewery, something I dreamed of for a long time now! 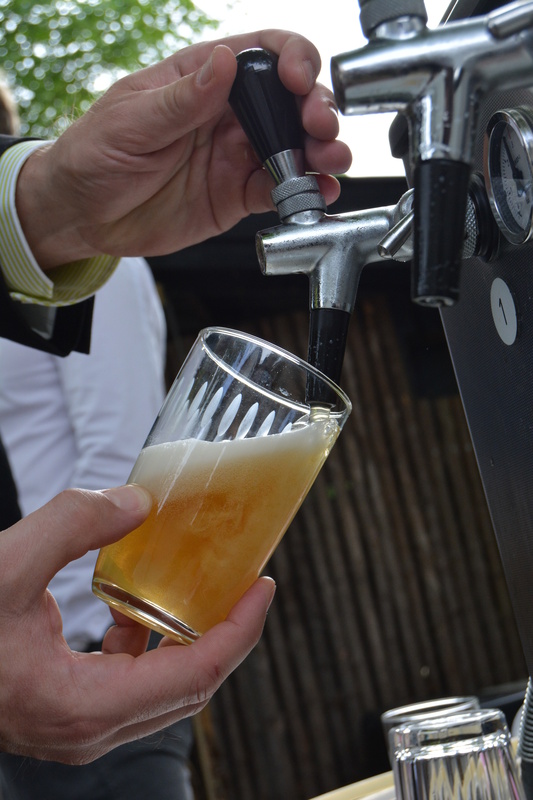 – and of course a tap to taste the beers! Yes, I know, not exactly finished, but I’ll keep you updated on how it’s going. The brewery door will come to the right, under the roof part that has tiles already. Exciting! Because of the lack of space, I had to brew outside this year, and that was a lot of fun!! 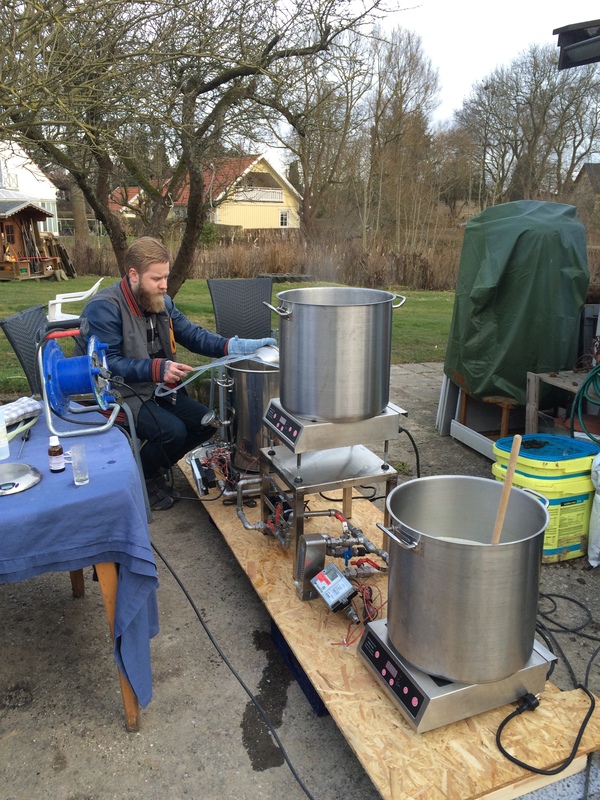 Very often, my friend Andreas came to help out and have some fun with my brewing kettles :-). Very different beers, all of them, but I learned a lot! I’ll be giving some feedback, when I am tasting those beers again, as many of them are aging beautifully :-). As Bride Blond v1.0 did not work out due to too high CO2 content in the bottles, but with a great taste, I brewed again, this time it had to be good, as this beer was meant for the wedding! This time I tried a little different recipe, to get it just right. 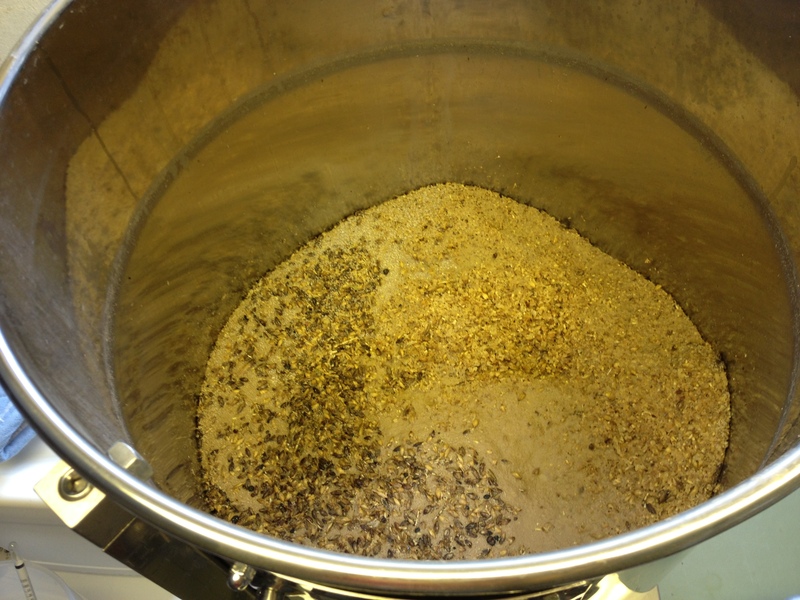 Instead of wheat malt, I used rhy flakes (havregryn), to get a dry finish in the beer. After fermentation in my fermentation cupboard, this beer was meant to be on keggs. That was a first time for me :-). But it worked! 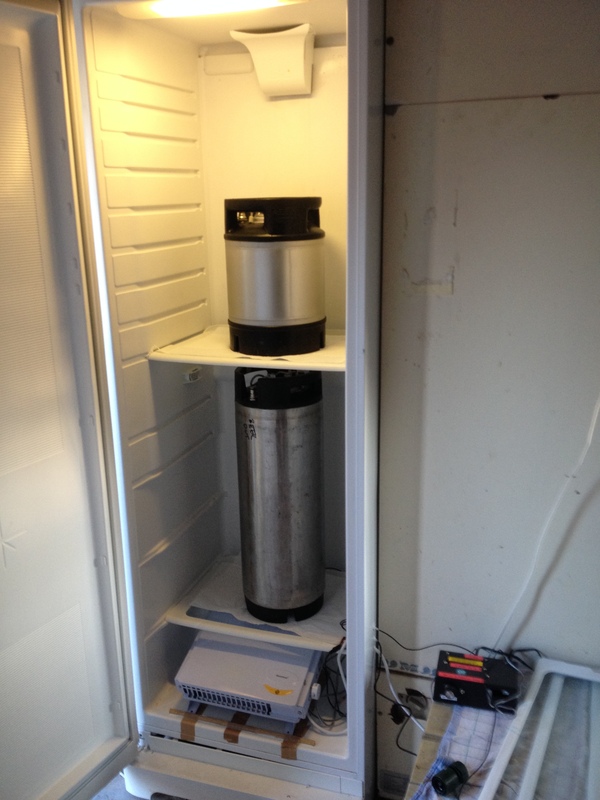 I filled the beer into 2 keggs (1 of 18 liter and 1 of 9 liter) and put them under pressure just before the wedding. I put them in the fridge – to be served ice cold :-). 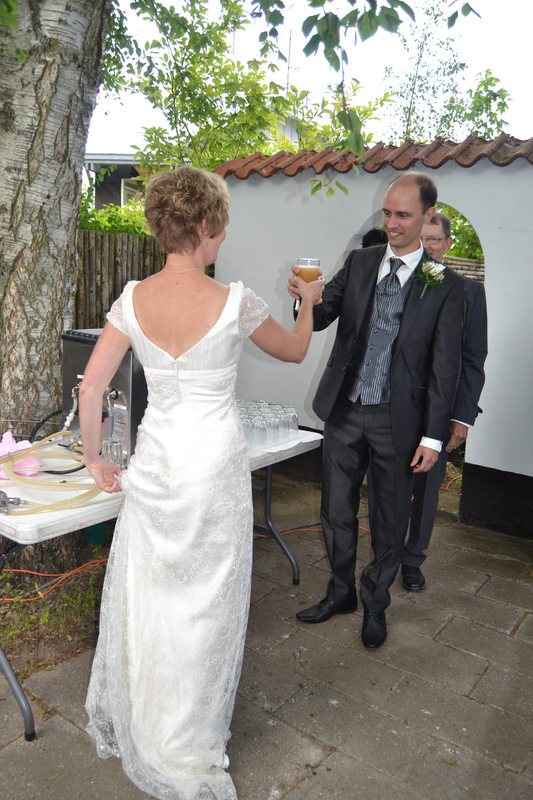 And then the big day….serving the beer! Amazing colour, foam and..taste :-). Oh yes, this is definitely my best brew so far. The style is IPA, with a nice hop finish of the citra hops, but not too much hop bitterness. And also my ‘new’ husband liked it very much! As well as myself :-). 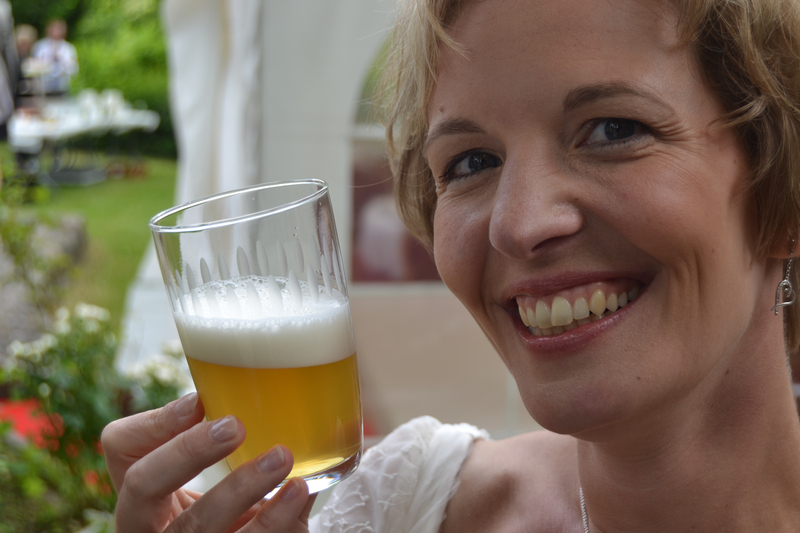 With our wedding coming closer, it’s time to start thinking about a beer to serve :-). It should be a light digestable beer, not too bitter, but with a good spring feeling about it. 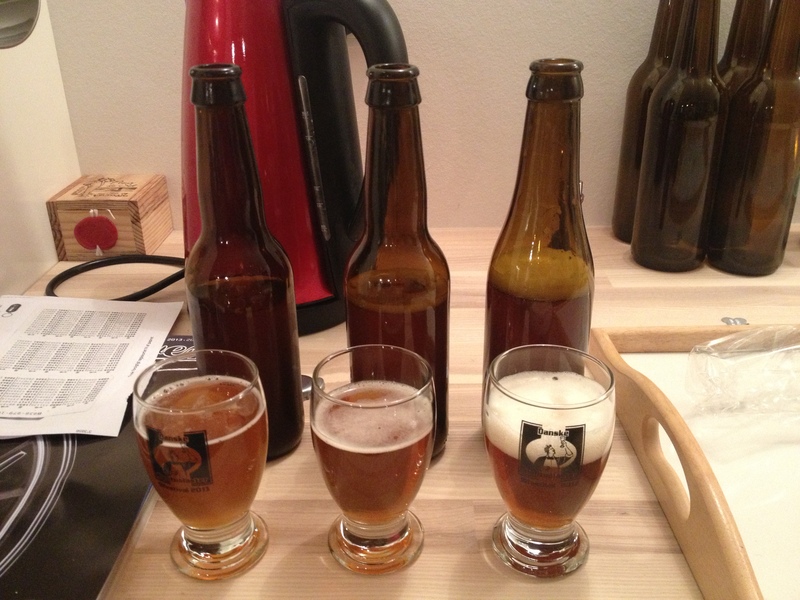 So I decided to make a light blond beer, brewed with different malts including some wheat. 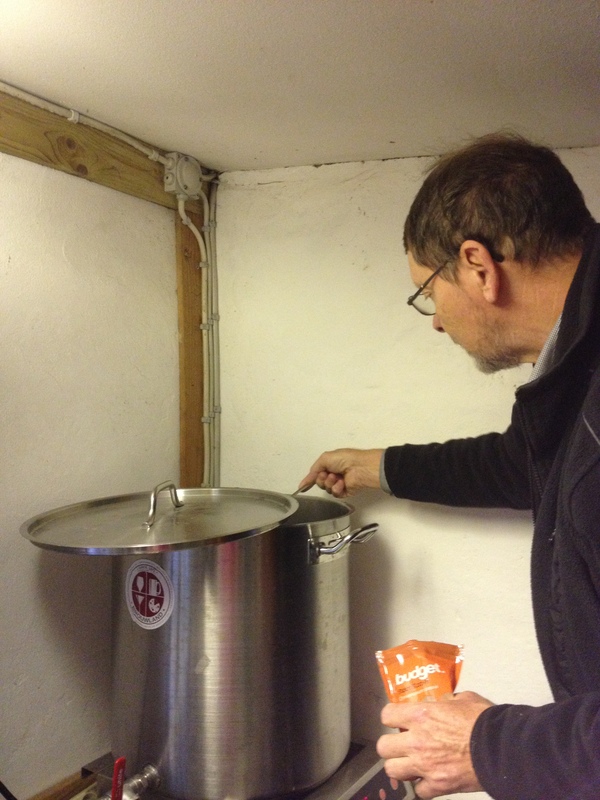 I brewed this beer already in December last year, with some help of my family-in-law :-). 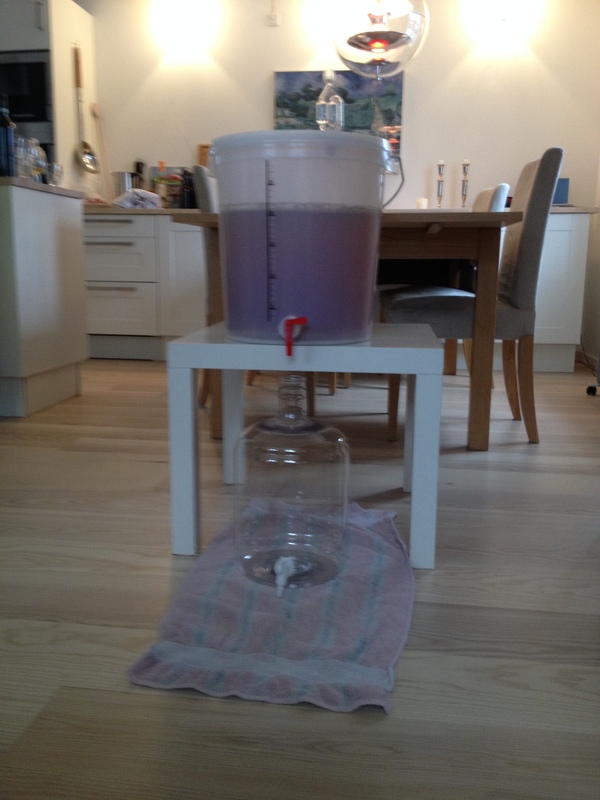 After a whole brewing day, 25 liter was ready to be fermented. 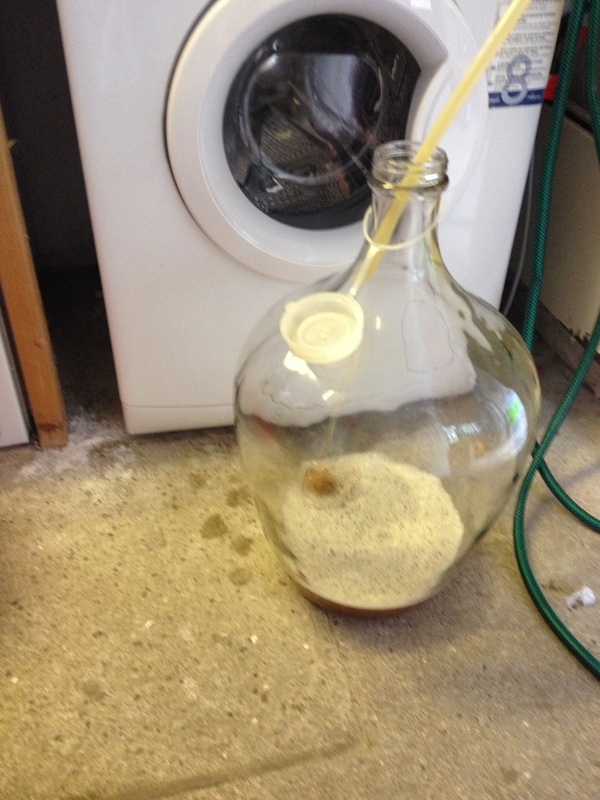 The fermentation was carried out in the specially build fermentation closet, and went on for 2 weeks. 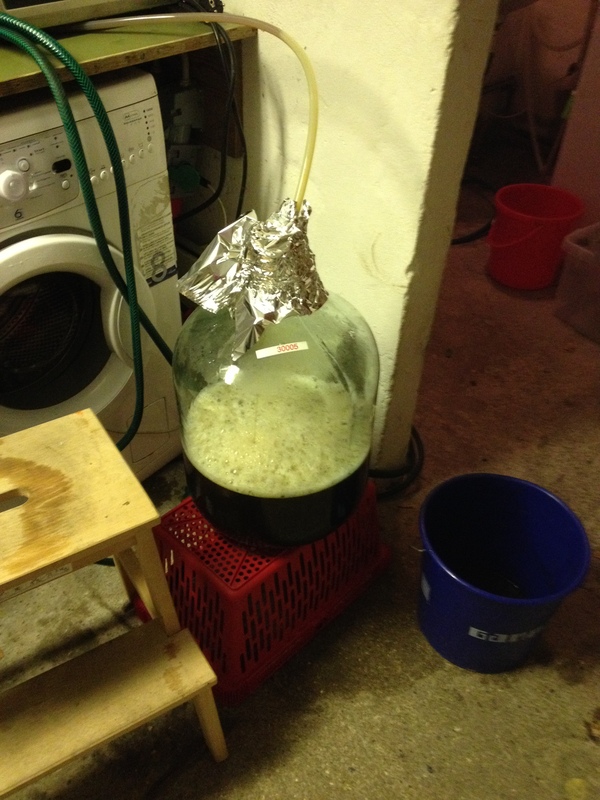 This time, I also used a oxygenation method to aerate the wort before adding the yeast. I noticed with my former brews that the fermentation often got a little stuck in the end and to prevent that, I used a small pump pumping air through a filter in the wort. I used that for 20 min. After fermentation, I put the beer in a new bottle, to be able to put it on bottles a little easier and to dose yeast and sugar in a better way. My self invented pumping-over system :-). Thanks to my brother who gave me this new type of fermentation bottle (I could only find this one in Belgium -> brouwland.com). And then the beer was ready to be put on bottles. Density check and go! After refermentation of three weeks, it seemed that I had added too much sugar, all bottles had too much CO2. A real pitty, as the taste is amazing! The best beer I have brewed so far. Not easy to drink though when all you get is foam. So I’ll have to brew again to get it right 😉 …. to be continued! A month before christmas, I started a new brew, my first christmas beer! I have never tried this before, a dark spicy beer, but for everything there is a first time :-). The mash looked quite dark, and was thicker than all my former brews. I also had a helper that day, my father-in-law, who was responsible for measuring the pH, not easy with the simple pH-meter I have 😉 and for adding the spices. With a teaspoon, yes indeed. And then, finally after the brewing, we could fill the fermentation bottle. Beautiful color! The fermentation took place during 2 weeks (in my homemade fermentation closet, see picture below) and after that, I refermented the beers in bottles with two different yeast strains: WLP013 London Ale, the same as the main fermentation, and WLP500 Belgian Trappist Ale, to get more fruity esters in the beer. 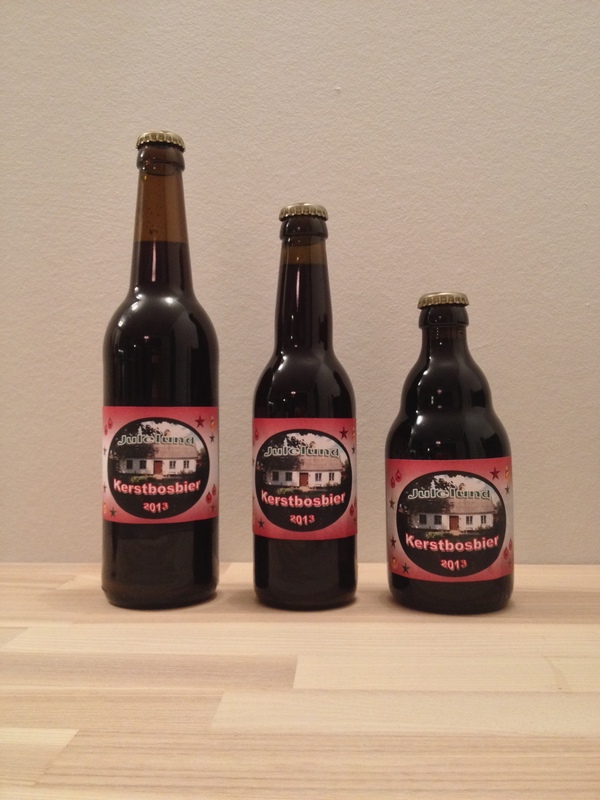 And for this special occasion (christmas), I also made labels for the beer. Looks way more professional :-). Belgian Ale refermentation: more esters/fruity nose and flavor, also more alcoholic taste. There was definitely a big difference between both beers and the London Ale was preferred above the Belgian Ale, because of better balance in flavor. 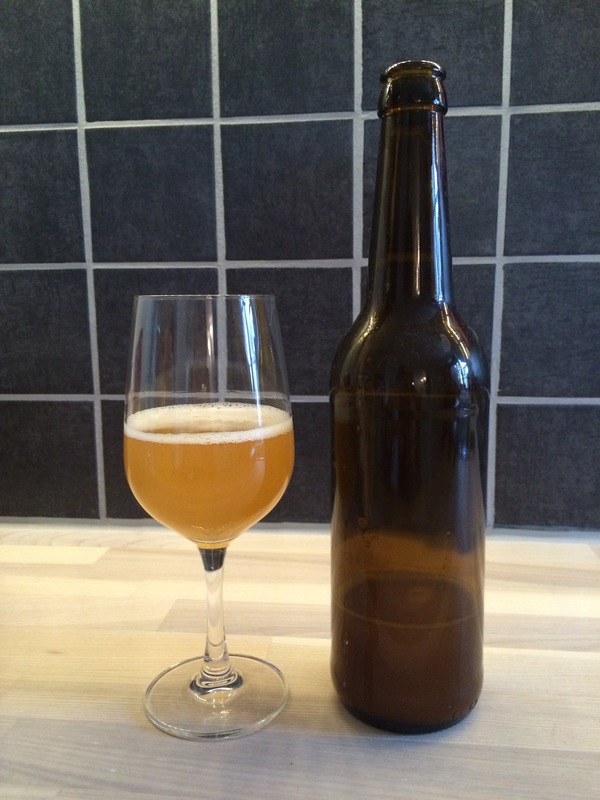 In my second version of Engel Tripel Ale, I tried to optimise the recipe, and used the same ingredients as version 1, but without the extra sugar. the yeast does not seem to flocculate well in the bottle, but has an amazing flavour, maybe I should try some different yeast strains for refermentation? So I tried again keeping all these issues in mind :-). 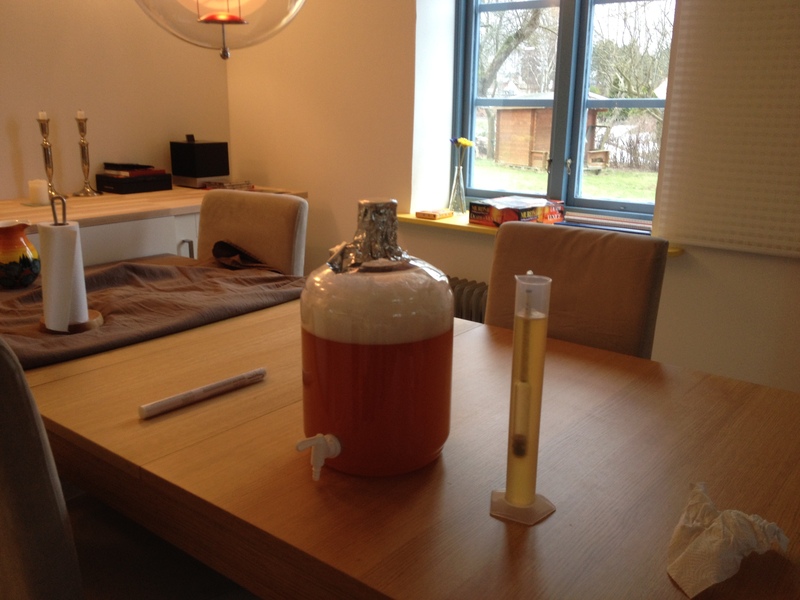 After all the hard work, I added the yeast to the bottle and here we go again… hoping for some magic of the yeast :-). 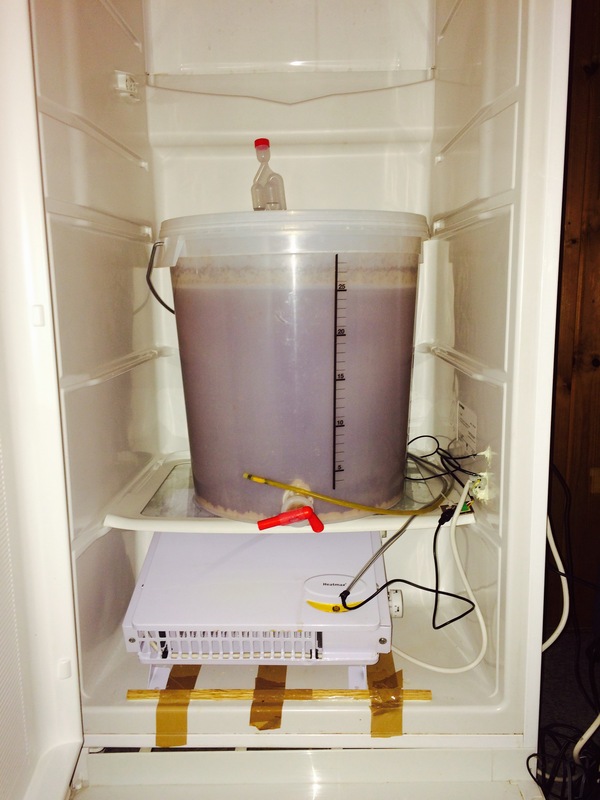 The beer is fermented at 20 degrees Celsius, keeping it constant thanks to an ingenious Arduino-system in my fermentation firdge. 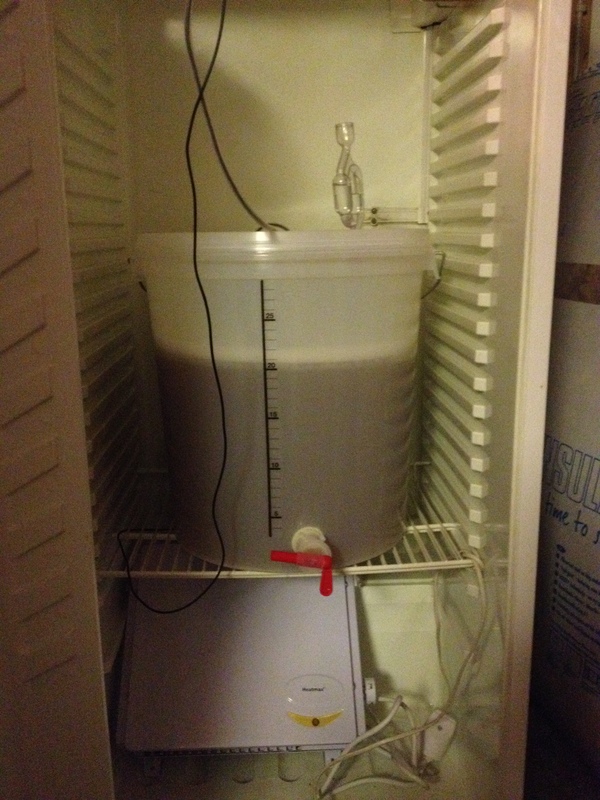 Then it’s waiting until the fermentation is over to mature the beer for another week at 4 degrees Celsius. Refermentation in the bottle was done with the same yeast, Trappist High Gravity yeast from WYeast, also at 20 degrees Celsius. After a couple of in- between tastings, I took the bottles out after 4 weeks. It seemed that there was less CO2 in the bottles this time, compared to Engel Tripel Ale 001. 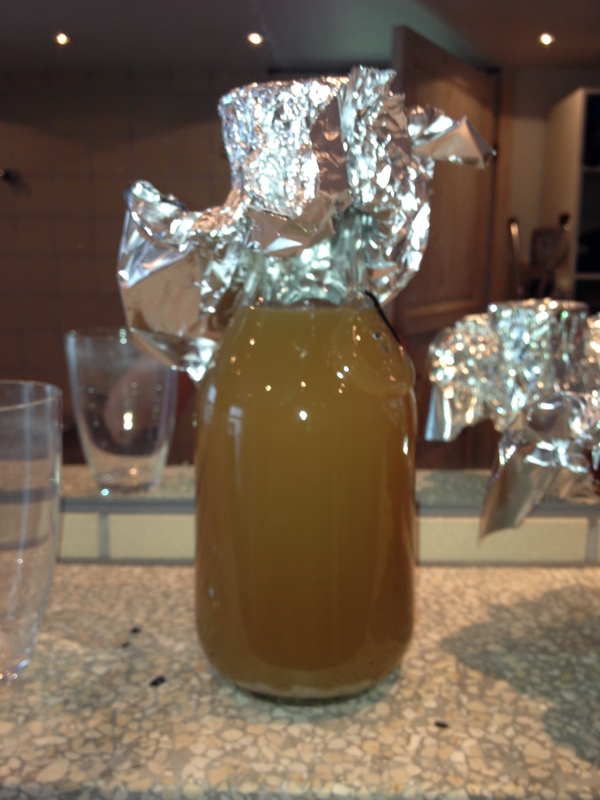 Although I used the same recipe, I added some home-made elderflower sirup to the bottles as sugar for the yeast. After maturation, it became very clear that the 002 version was already much better than the first one. The taste was less malty, but still fruity. Now it is even getting almost too thin in taste. But I’m very pleased, as I could solve already some issues. After some patience, enough CO2 was formed, and the beer tasted very fresh and fuity. To be continued…. 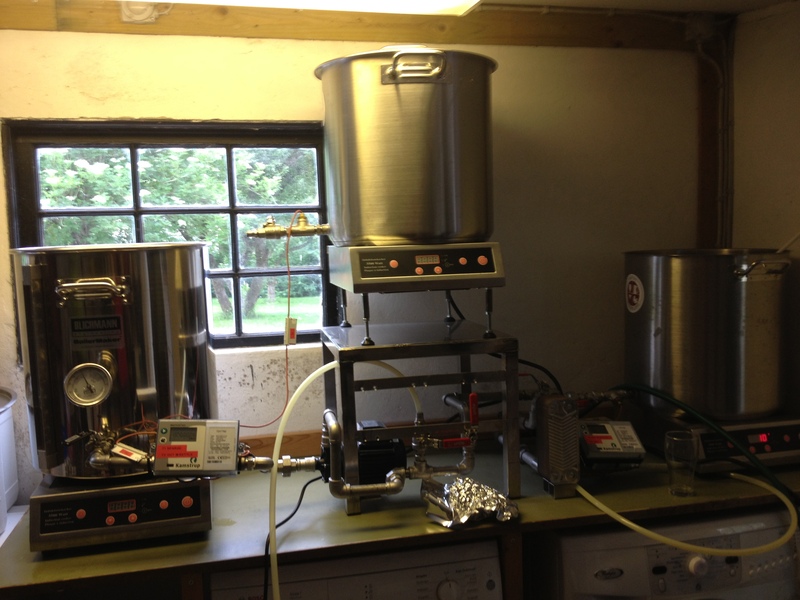 In June 2013, I became the happy owner of a home-brewery, and started my adventure as homebrewer. The first beer I brewed is called Engel Tripel Ale and is a combination of a Belgian Tripel with a Danish Ale-style beer. The result was surprisingly well-received by my family and friends that tasted the beer. The recipe has been inspired by the book ‘Brewing classic styles’ by Jamil Zainasheff and John J. Palmer. Here are some pictures of my first beer-adventure :-). 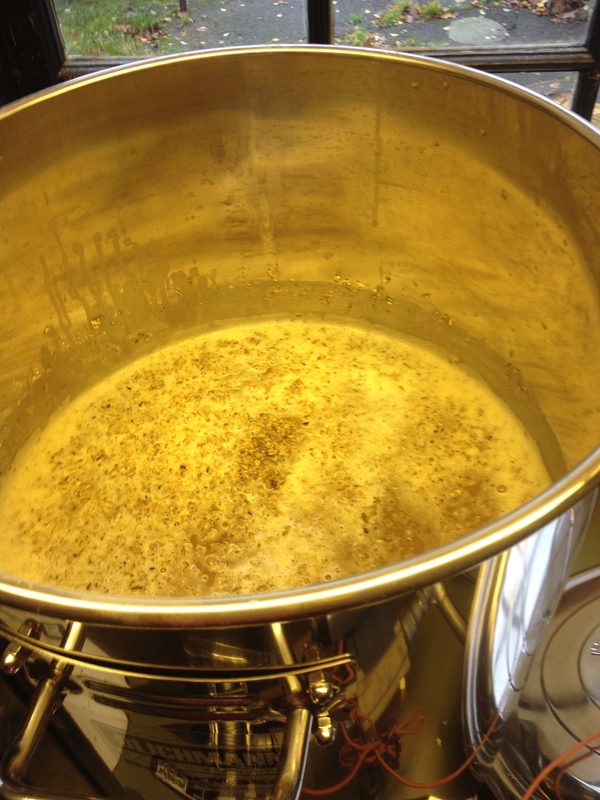 In my homebrewery, beer is made from scratch, that means starting with the malt. And I found out that maisching is a key process in the whole beer brewing process. Luckily, I have a Blichman maisch kettle, heated by an induction plate. So I can change the temperature quite correctly, but still need to check with a thermometer for the right temperature. It’s an art! After maisching and boiling, it’s time to cool down the wort and start fermentation. Now my favorite organism will be added, yeast indeed. And then, the magic happens. This is a homebuild fermentation room. 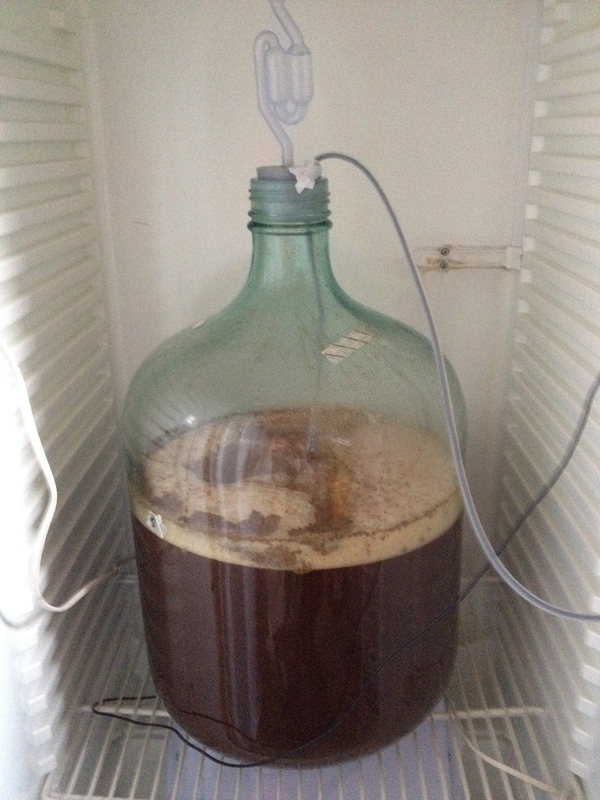 Thanks to my father-in-law, the temperature can be set at a the perfect fermentation temperature. The ‘room’ is an old fridge, the temperature control system is an arduino-system. Yeast starter culture, ready to be added to the wort. Our bathroom seems perfect temperature for starting the yeast :-). 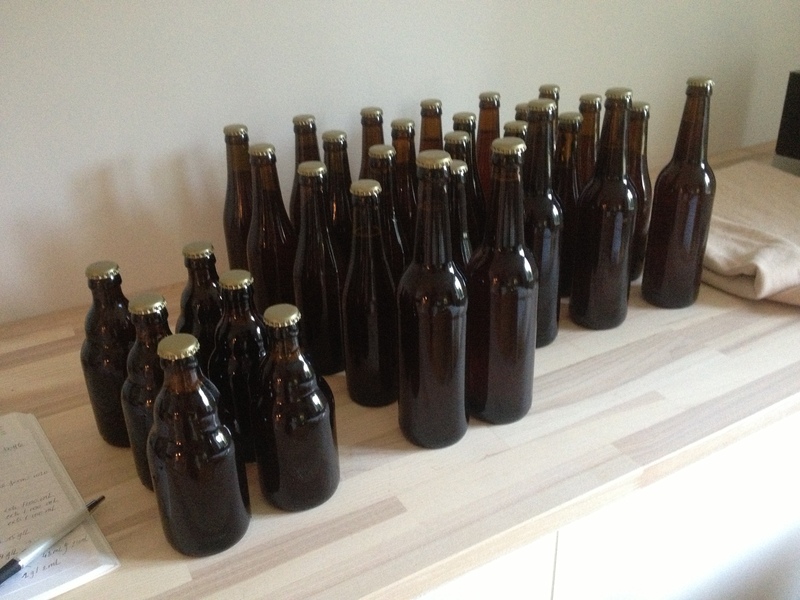 All this work resulted in 12 liter of beer, refermented in the bottle. 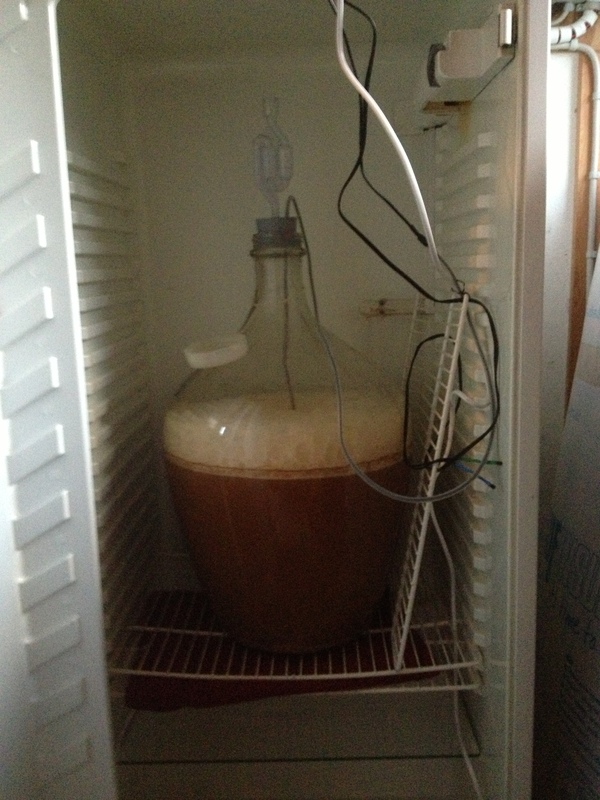 For my first beer, I used the same yeast in the main fermentation as well as the refermentation. WYeast 3787, a very fruity yeast, but that does not flocculate as it should. Tasting: the beer tastes like a mix between ale and Belgian style tripel. Very fruity nose, but a bit too heavy in the mought. Also a bit burnt, needs to be adjusted next time. 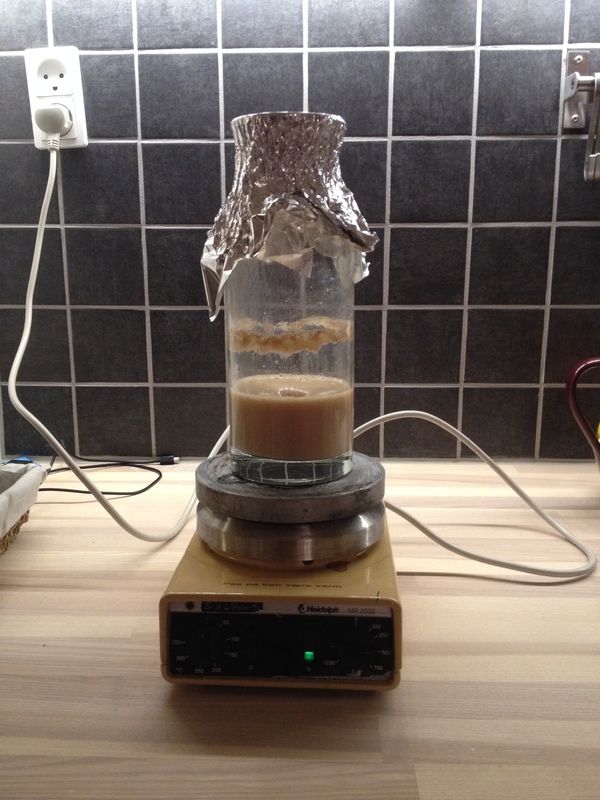 I will update this blog with all crazy experiments that I’m performing at home.